History radiates from all the corners of this market right in the old part of Madrid and at the same time it offers the most interesting innovations in terms of culinary art. The walls made of glass invite the passersby to take part in what happens inside, encouraging them to go in and find out about a world of flavors and smells one cannot forget. And it is not only that you can buy things and cook them at home, but you can also have tapas in different places, they have various types of food. You can eat directly at the counter or in the area made for this purpose. Every corner of the market has a specialty: seafood, cold meat, croquettes, bread, candies, wine, etc. On the cod fish stand you can have different types of it for 1€ each snack, you get it on a small tray, and then you should go and get a drink to enjoy even more. After two years of building works, this market opened again in May 2009. It is now dedicated to gourmet food and the prices are indeed the usual ones for this type of products. There are many bars, tables and benches in the center, you can order at the different stands and taste them right there, even though it is quite difficult to find a free spot. It is always very busy. One of the most curious stands is the one with oysters and caviar, called Sorlut. There is also a seafood stand, a codfish shop, a cake shop and even a flower shop and a bookshop. Old market in the center of Madrid (next to Plaza Mayor) turned into a posh and somewhat snob place. It is worth visiting it because it has been restored with much taste and on almost each stand there is something you would devour without pity. Good pork butcher's, excellent cheese, amazing fruit stand, you can also eat oysters... They even have a bookshop specialized in gastronomical topics, a place where they sell candies, wine, alcoholic drinks and exquisite "pinchos" (snacks) to have from 1€, delighting your palate. 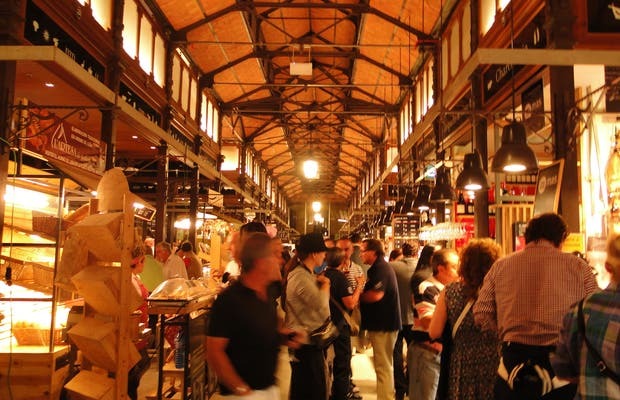 The San Miguel Market has turned into one of Madrid’s top tourist destinations since it’s reopening in 2009, and with good reason. Aside from being gorgeous on the outside, the market is home to wide variety of posts and stalls which attract hordes of tourists both from Spain and abroad. You can find everything from flowers to cheese, legumes, fresh fish, and even caviar. You can actually taste most of the products available and there are tables set up to enjoy your food or just have a drink while soaking up the atmosphere. I must say that it’s not the cheapest place to do your day-to-day shopping, but it does gather most of Spain’s top products into one comfortable place. San Miguel Market is historical. Very recently however, the last building works have turned it into one of the most touristic places in Madrid. And no wonder why. It is quite similar to the Boquería Market in Barcelona (although somewhat more exclusive or gourmet and less of a traditional market). The perfect place to have an aperitif or a salty snack, the typical Spanish "cañas and tapas" that is. Obviously it is not cheap. It is very touristic and has high-quality products. But even so it is a place you cannot miss out on if you visit Madrid.